In a seminal paper, Hiroshi Uchida of the Toyota Central Research and Development Labs has given a dramatic technical insight into where turbocharging is headed. The paper, Trends in Turbocharging Technologies, shows how turbos will be used in the next decade of high fuel efficiency, low CO2 emissions engines. Linking compound twin turbocharging with electric motor assist and variable geometry turbos, Uchida explains the form in which turbos will dominate production car engineering. So what is driving the move towards turbos? This diagram shows the trend in specific power (ie power per litre) of diesel engines being sold in Europe. As we have described in Common Rail Diesel Engine Management, Part 1, common rail diesel fuel injection and turbo intercooling have revolutionised diesel power. High specific power will be achieved not only with more extensive use of variable nozzle turbos and variable vane turbos, but also by means of turbos boasting electric motor assist. The latter technology has been mooted for years (see Turbo Revolution - The Coming Technologies Part 2) but is now getting very close to public release. And it’s not just in diesels. The same forces are driving petrol engines towards smaller capacities and higher efficiencies – and that spells forced aspiration. However, in many respects, turbos have been slow to change their technology. Despite over 50 years of development, conventional turbocharged engines still suffer from a lack of low-speed torque. This is because the turbo must be large enough that it doesn’t restrict exhaust flow at high loads (ie cause excessive backpressure) but must be small enough that it can spin on the low flow of exhaust gas being produced by the engine working at the bottom of its rev range. 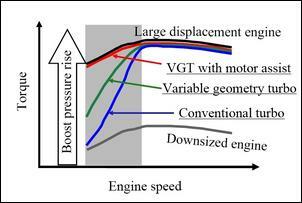 This diagram shows the torque production versus engine speed of a variety of engineering approaches. The upper black line indicates the torque development of a large naturally aspirated engine. 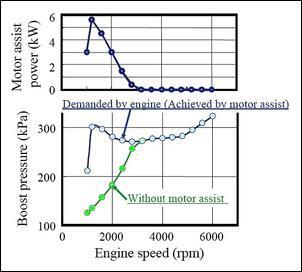 The lowest grey line shows the torque output of a smaller (“downsized”) engine that can produce lower absolute emission outputs and gain better fuel economy. A conventional turbo, shown by the blue line, takes about one-third of maximum rpm before it reaches full boost. A variable geometry turbo (green line) is substantially quicker to boost, but it still cannot reach full boost pressure at revs just off idle. However, a variable geometry turbo with electric motor assist (red line) can match the larger naturally aspirated engine. From all that you could assume the problems are as good as solved: just fit an electric motor to a variable geometry turbo. However, there are aerodynamic, thermal and electrical problems to be overcome. 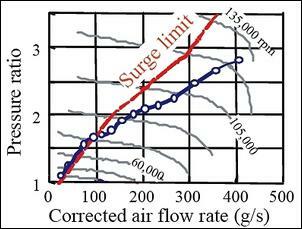 There are two ways of eliminating the problems of compressor surge. The first is to use twin differently sized turbos, with the smaller turbo used at low engine speeds. The downsides of this approach are cost, complexity and packaging. The other way of overcoming the surge problem is by bypassing compressor discharge air back to the inlet side of the compressor. 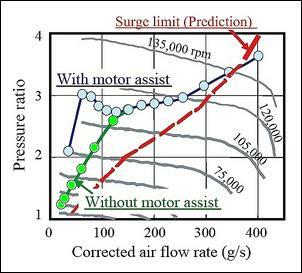 However, the increase in required compressor power causes an increase in turbine drive power, in turn causing an increase in engine exhaust backpressure. As a result, fuel consumption suffers. 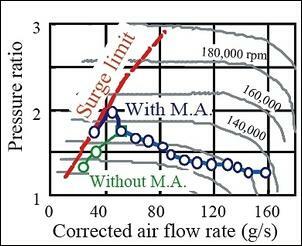 The surge limit can also be improved by variable geometry compressors and internal compressor recirculation using “a casing treatment on the shroud wall”. 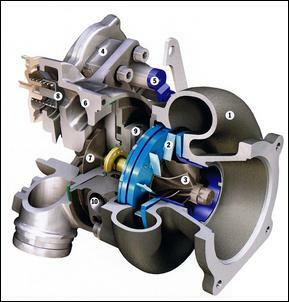 Variable geometry turbos have been used on diesel engines for years. They feature adjustable guide vanes to change the behaviour of the turbine housing, allowing the turbo to spin fast at low gas flows. However, until recently, they have not been able to be used on petrol engine cars. The reason that this has been the case is the much higher exhaust gas temperatures produced by petrol engines. These can rise to as high as 1000 degrees C, versus the 700 degrees encountered in diesel engine exhausts. However, the latest 911 turbo Porsche uses a specially developed variable geometry turbo featuring exotic materials able to withstand the high temperatures. Overall, the turbo looks like this. (1) Turbine casing, (2) Movable guide vanes, (3) Turbine wheel, (4) Electric motor for guide vane adjustment, (5) Guide vane adjuster, (6) Compressor casing, (7) Compressor wheel, (8) Excess pressure valve, (9) Oil inlet, (10) Coolant inlet. An electric assist turbo adds an electric motor to an otherwise fairly conventional turbo. 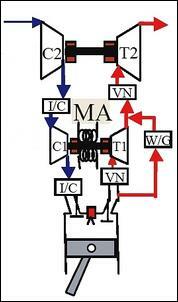 A permanent magnet is mounted on the turbo shaft and the stator is located in the bearing housing. Keeping the assembly cool is both important and difficult. 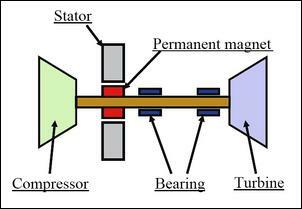 Another problem is that the outside diameter of the magnet is limited because of the speeds at which a turbo spins – if the magnet diameter gets too great, the magnet is liable to fly off the shaft. Using a longer magnet avoids this problem but changes the dynamic behaviour of the shaft, especially in its resistance to vibration. While major turbo manufacturers have been working feverishly on electric assist turbos for at least 5 years, none has yet reached the light of day in a production model. But, as the Toyota Central Research and Development Labs technical paper suggests, they’re now very close. This diagram shows the corrected airflow rate versus pressure ratio for the variable nozzle turbo, with and without electric assist. 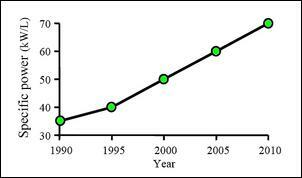 The turbo, both with and without electric assist, is in surge over nearly the whole of the graph. So while a single variable geometry turbo with electric assist can provide the desired boost pressures across the range of engine revs, there are problems with compressor surge, compressor construction, outlet pipe construction and the required electric power. The next system examined used two differently sized variable nozzle turbos, the smaller of the two equipped with electric assist. 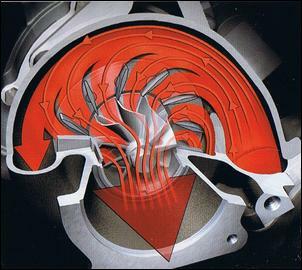 As this diagram shows, only one wastegate was fitted and intercooling occurred between the turbos as well as between the smaller turbo and the engine. Also note the compounding of the turbos - one blows through the other. 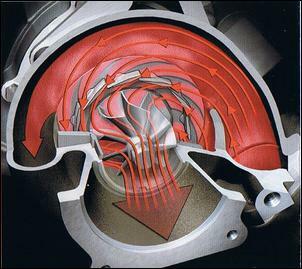 This diagram shows the performance of the smaller turbo. The turbo stays inside the compressor surge limit and, with motor assist, develops high boost at low flows. With both the smaller electric assist turbo and the larger turbo working, high boost is available across a wide range of airflows without much exceeding the compressors’ surge limits. Importantly, “the motor assist power of 3kW is less than that of the single-stage turbocharging system”. As you’d expect, transient performance (ie boost response with sudden throttle changes) was also greatly enhanced by the use of an electric motor assist turbo system. Toyota’s testing showed that when there was 1.5kW of electric assist, the time taken to achieve 200 kPa boost was cut by about 30 per cent, and when 3kW of electric assist was used, by about 40 per cent. However, with the higher rate of electric assist, boost overshoot was a problem. The testing carried out by the Toyota Central Research and Development Labs indicates that the use of a compound twin turbo system with variable nozzle turbos, dual intercoolers and electric assist on the smaller turbo is viable technology. Writes Uchida: “It seems clear, therefore, that in the future the individual development of engines and turbochargers will be supplanted by the development of turbocharged engine systems. And when you see your first twin turbo, twin intercooler, electric assist turbo Toyota – you read it here first!